Pictures of overflowing dinghies. Angry tourists whose vacation is ruined by the confrontation with reality. Asylum camps and statistics. The media are full of images that for the vast majority of Danes’ is the first and perhaps only meeting with newly arrived refugees. The performers are from Eritrea, Syria, Afghanistan, Congo, Uganda and Iran. 2015 Edison Teater, C:ntact and Dansk Flygtningehjælp integrationsnet. Directors: Kasper Sejersen and Mia Lipschitz. Design: Kasper Sejersen and participants. Sound Weronika Andersen. Light, Kasper Daugberg. Workshop leaders Zaki Youssef, Wahid Mahmoud, Young, Helle Rossing, Dawit Halle, Josephine Nørring. Tariq al Saies. Production: Babak Wakili. Michael Svennevig: The performance starts and ends with ripples. In the beginning it is threatening seas. In the we hear about those refugees who make the trip across the Mediterranean and those who don’t make it , while in the end is comfortable lapping of the waves as a flagpole with Dannebro is carried in and just barely able to stand upright in the high-ceilinged room, while all sing the song that gave the name to the performance. Bamse’s scourge sung both from the stage and the audience. It seems like a sweetened bitter pill after all the life stories which we have witnessed this afternoon at Edison. There is the Syrian officer with face as cut in stone, recounts that he went into the military to defend the country and fight for the good, but when the army was deployed against the population and killed his own family it left him with just two options: to be in the army or to desert and risk his life by fleeing. When they step up to the microphone we read them intuitively. We see it in their faces, we hear it in their voices. It needs no translation. It is like a drawing of the body and a shadow across the faces. We see and sense their struggle. These are the survivors. They are the ones who escaped. Those who got up and went on. Those that never reached are also here. As shadows are they here. But it is also a meeting with our selves. We, the audience, look at them, as were we looking in a mirror. We are safe and well fed in the hall, while the refugees on the stage appear as themself. They dance, sing and act. Their stories requires no dramatization, but an eye for how to build up a direction with so many people, in a 5-week workshop, which has been the basis of the performance, leading up to what we now see and experience on stage. The 50-year-old couple, Amal and Khalid are stateless Palestinians from Syria. They talk about how they met. A story that could have taken place anywhere and at any time. Their three daughters, was in the band of the performance. The 16-year-old daughter gets up from her stringed instrument to sing a touching beautiful Arabic song. The text is also displayed on the back wall. It’s about Sara. Little Sara with a bullet hole in the head. Sara who the sniper got. Maher from Syria, in the 20s, would have escaped alone, but the neighbour paid him to take the 15-year-old son with him. He could not afford to say no. Before the boat, they were offered to buy life jackets for 50 euro each, but they could not afford to. They were 20 in the dinghy. The man who steered was lousy at it, so they went off the course and ended where there was extra close and strict coastguards. They had to puncture the boat when they were discovered and a coastal vessel approached, because if they were drowning the coast patrol would be required to pick them up. Everyone in the area had been given strict instructions not to help the refugees. 18-year-old Hafiz from Afghanistan is handsome and resembles most of all a swarthy Prince Valiant. He dreams of becoming either an actor or a police officer. It’ll succeed. Along with Shirin, a beautiful girl, they illustrate the cheerful “Love in Afghanistan” where the guy lets a note fall to the ground and the girl who concealed and blushing picks it up. In “Love in Syria” it is the girl who throws a note to the guy who triumphantly grabs it. While in “Love in Denmark” they were both wildly dancing and drinking – and without notes. Mohannad is 24 years old, from Syria. He helped to buy drugs and bring it to the besieged areas outside Damascus. When his contact was revealed Mohannad had to escape. After nine months he talks is surprisingly beautiful and nuanced Danish and dreams of taking a PHD in Chemistry in Denmark. His elegant Danish language proficiency clearly showing that he will succeed. But he misses his cat and hope and long to get a new cat which no doubt would also become the world’s smartest cat in chemistry. The transgender Brenda was jailed nine times in Uganda for being who she is. While she was in prison the last time the law to ban homosexuality was agreed and therefore she had to flee. But she is happy to be in Denmark and especially for the hotel, where she is accommodated, where she even gets treated well. In her home country, it is forbidden for someone like her at all to stay at the hotel. All 60 participants have been in Denmark from 2 months to 1½ years. It is overwhelming how well some of them speak Danish. 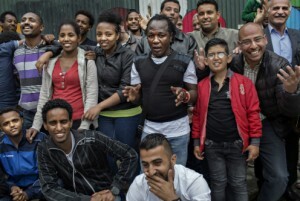 They are from Eritrea, Syria, Afghanistan, Congo, Uganda and Iran and have spent the past five weeks in the company of professional directors and coaches in theater, rap, song and documentary film. Many volunteers have contributed to make it all happen. The talented workshop leaders have been Zaki Youssef, Wahid Mahmoud, Young, Helle Rossing, Jonas Rohold and Torben Simonsen. Josephine Nørring was acting coach. For directors Kasper Sejersen and Mia Lipschitz it is a personal victory and a professional achievement that they have managed to get the performance’s many participants and even more their stories to become an organic unifying whole. A SMALL BOAT that rocks is a performance that puts faces, names and stories of the newcomers. They dream of democracy and human rights. About getting a life without war, where they can study and work, fall in love and start a family. They dream of being part of Denmark. As one of the participants said in the subsequent Q & A, so they trust us, but it’s hard to find the way into, for them, a completely new society. They cannot do it alone. We also have to trust them.